Do you need to go to the doctor? You look a little different, wait, we are pretty sure it is just the Disco Fever setting in! Once you get into the groove of the music, you are sure to feel more alive than you have felt in a long while. This large gold Disco Necklace, will leave no room for questions, everyone will know who the best dressed and accessorized person is on the dance floor. While this pendent may be faux gold, your dance moves are going to be the real deal! The only thing brighter than your sick moves will be that disco ball hanging from the ceiling. 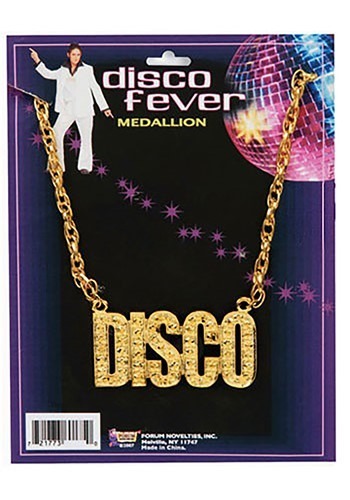 Awe sooky sooky, you'll be blazin' in this Gold Disco Necklace. That’s not just the jive talkin’, you'll be the hottest body on the dance floor this Saturday Night! Can you dig it?